He never intended to be the owner of a car dealership, much less one of the nation’s best. But for Brent Brown, who’s been nominated for the 2018 TIME Dealer of the Year award, it’s just the latest in a long list of accolades that Brent Brown Toyota in Orem has earned. In March, Brown was named one of four national finalists for TIME Dealer of the Year, a prestigious national award for auto dealers who stand out in their community. The award is presented by TIME in partnership with Ally Financial, and Brown was selected from a pool of 47 dealer nominees across the country. There are 16,500 automobile dealers nationwide. Brown, 58, graduated from Brighton High in 1977, but by his own admission, “Just barely. I was so focused on being a musician as a teen.” He was lead singer/guitarist for a rock band called Road Works. In the mid-70s, they were the hottest local band in Utah. Road Works opened for several national acts, including ZZ Top at the Salt Palace when Brown was just 17. “I was living my dream as a kid—rock-and-roll, but my first life lesson came after that performance with ZZ Top. The reviewer for the Salt Lake Tribune said we were ‘good but not distinctive.’ I decided at that moment that I’d never not be distinctive,” says Brown. His two-year stint in England took him, ironically, to the hometown of the Beatles. “We knocked on doors of people who knew them personally.” By the time his mission ended, he’d served as an assistant to the mission president, Ellis Ivory (founder of Ivory Homes), who offered Brown a sound piece of advice. “I told him my plan was to go home and study to be a dental lab technician, but he said, ‘You’re the most naturally talented sales person I’ve ever encountered in my life. Go back and sell,’” remembers Brown. Brown returned to the United States and moved to Texas, where he had family members. He set out to sell real estate, but Texas had a two-month residency requirement. Needing money, he was hired at a Volkswagen dealership in Austin. “I had only intended to do the job for two months, but I became the dealership’s top salesperson the first month and then broke the dealership’s all-time sales record the second month. So I decided to stick with it,” he says with a smile. Success in the auto industry has followed him. He returned to Utah in 1986 and has worked for—and been partner-owner of—several dealerships. 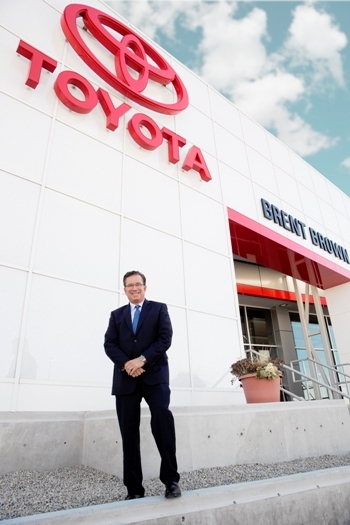 He became sole owner of Brent Brown Toyota in 1999, which is Utah’s largest volume new-car dealership, and for Toyota, a top 10 dealer in the nation and No. 1 nationwide for customer retention. In an industry where a typical repeat customer ratio is 38–40 percent, Brent Brown Toyota has a repeat customer rate of 69.2 percent—unheard of in the industry.